Where my farm is not made of plastic. Where I am allowed to go outside alone. Where I can eat the snow. Where the night is still dark. Welcome to the Almfamilyhotel Scherer. You will find us at an altitude of 1450 metres in the idyllic Alpine village of Obertilliach in the valley of Gailtal, East Tyrol. Look forward to a wonderful family holiday in the mountains, between the gorgeous Lienz Dolomites and the Carnic Alps. When spring begins in the valley of Gailtal, Tyrol, sun skiing is the favourite activity of our winter guests. Until Easter, skiers and boarders can enjoy the slopes of the Golzentipp. Grippy snow and much sun mark the best time of the season for many winter sports enthusiasts. Backcountry skiing is sometimes possible until early May. In the meantime, the sun gets warmer every day and lures the first flowers out of the still cold earth. Discover East Tyrol’s charms during springtime! In their summer holidays, families enjoy pure freedom in the natural surroundings of Obertilliach. Colourful wildflower meadows, shady forests and clear mountain lakes let the holidaymakers breathe through and become calm. During hikes in the surroundings, there is a lot to discover. From the valley you can climb up to the peaks of the Gailtal or hike to the alpine pastures in the surrounding area. Especially younger children will enjoy a ride on the ten-seat Golzentipp cable car above the sunny slopes of the mountain. In autumn, the Tyrolean Lesachtal is transformed from lush greens to a sea of yellow, golden, orange and red. On the meadows, the hay is dried and the farmers bring in the harvest before winter. Hikes in autumn lead you to a multifaceted mountain world where the huts will invite you to refreshments with hearty snacks and kaiserschmarrn. In the villages, many celebrations will invite you to join the locals and enjoy the sun rays of autumn. Also, day trips are a real joy at this time of the year. Skiing and winter simply belong together in Austria. 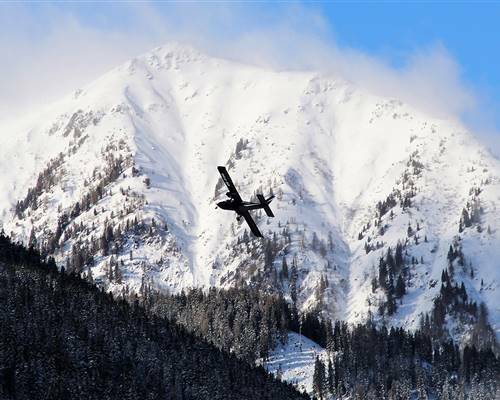 In Obertilliach you can enjoy your skiing holidays with children far away from mass tourism. 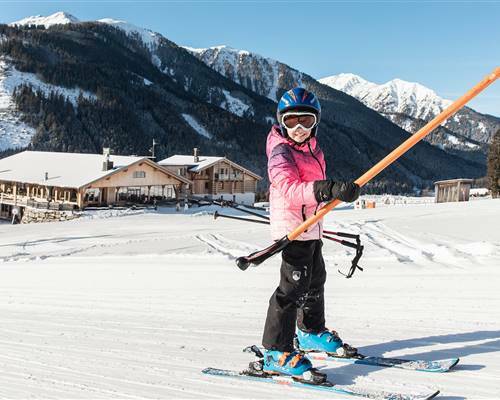 The ski region at the Golzentipp is ideal for the little ones’ first tries on skis with its T-bar lifts and easy slopes. But also advanced skiers on snowboards and skis find suitable slopes in the excellently groomed ski region. Wild fun will await the whole family on the 7 kilometres long tobogganing run which leads from the ConnyAlm right down to the valley. You can see that the winter in the Lesachtal has several things to offer. Family is important to us. Therefore, we strive to turn your stay at the Almfamilyhotel Scherer into a wonderful experience, during which you can savour the pleasant things in life. 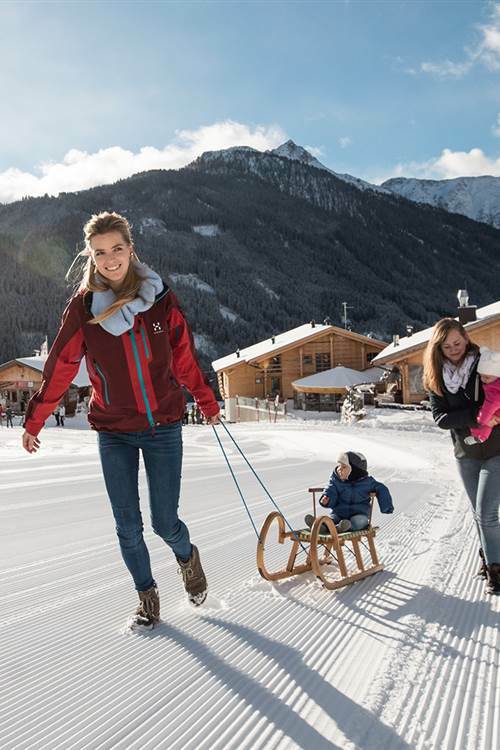 Our team and the Scherer family want to spoil you with traditional East Tyrolean hospitality. The location could not be more idyllic: The Almfamilyhotel Scherer lies on a sunny plateau between mountain pastures at the beginning of the village of Obertilliach in East Tyrol. During all seasons, you can enjoy the stunning view of the Carnic Alps, a mountain range of the Gailtal. All suites and terraces face south. The interior of the hotel will await you with harmonious designs combining modern elegance with elements from the region. From the Almfamilyhotel Scherer you can explore everything by foot. In winter the ski slopes are right on the doorstep and in summer hiking paths lead right past the hotel. Enough space for parents and children with bag and baggage: In the family suites you can truly unfold. Well-being is made easy thanks to the facilities that are functional as well as stylish. Natural wood produces warm comfort. 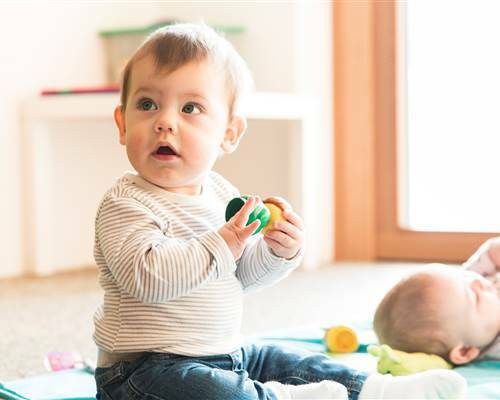 Of course, both the children and the parents have their own bedroom in the Almfamilyhotel suites so that everyone will find optimal rest and recreation. In our water world, there is space for both joviality and quietude. Adults and teenagers can relax in and around a separate, spacious pool while the kids’ area is reserved for little water lovers. The panoramic windows will offer a great view of the mountain world of Obertilliach. A true visual delight while you swim in peace or relax on the loungers. And in summer the beautiful outside area will attract you with its sunny meadow. A good meal with your loved ones should always be part of a truly unforgettable holiday. Our kitchen staff only uses fresh, local ingredients and selected delicacies to create their culinary delights. They always focus on the needs of their younger and older guests as well as a healthy and balanced nutrition. Seasonality, quality and freshness: These are the main ingredients in the Almfamilyhotel kitchen. Therefore, we also know the producers of our good food personally. With skills, experience and of course passion for the art of cooking, these ingredients are turned into creations that will make you smile. 2 toques by Gault Millau are a true reward for our kitchen team around Thomas Ebner. Enjoy your meal! In the hotel restaurant of our Almfamily hotel little as well as grown-up epicures will get their money’s worth. From the breakfast buffet with a special cereal corner to the evening menu with an own children’s menu you are delightfully cared for. The ingredients come mostly from East Tyrol, South Tyrol and Carinthia which is also written on small labels on food and ingredients. Small guests have their very own preferences when it comes to food. The All-in-Himbeergolli offer includes, for example, many specially created children’s dishes with healthy and regional ingredients that are a delight for children’s palates. Different cereals, home-made jams and a selection of fresh fruits are especially popular with the children. As a highlight, our mountain dairy ice cream will be a great dessert!